It took a moment to transition from the dream I was enjoying then awaking to the van aglow with the spotlight of the local law enforcement. I lay there a moment looking at my bare knee glow like a beacon from the bright light. I could tell, from the chit-chat on the radio, it was going to be a minute before the obligatory knock on the window and a check of my license. Then the explanation of why the world is tied to a purple van with out-of-state plates, how it all landed here, in this jurisdiction, and why. The first shirt I blindly reached for was a gift from a policeman who doubled as a firefighter in Daphne, Louisiana. While he called in my information I slipped on my pants, shoes, and "big Texas hat" (given to me in Lufkin by a direct descendent of Jesse James) and stepped out of the van ready for a good stretch . Since I was awake, I thought it would be a good time for me to check on Nice (the dog). It took a couple of moments for the officer to grasp the story. He questioned if i had really been there the night before because he hadn't seen me and surely he couldn't have missed this the previous evening. He had also missed me the three other nights I was parked in the parking area out in front of the plaza by the highway, hiding in plain sight. On the outside chance the van might be stolen the officer asked for my vans registration, the vin#. I praised him for his thorough treatment while he wrote the number on his notepad as he had been the first in six years to check my registration. I recalled a few of the places, with the officer, where I have been added to the "system" across the nation. We laughed about that. He was shaking my hand , wishing me a good night sleep and thanks for my dedication to the cause before it was all over. He gave me his card. l walked away around the building to the office to give the dog a chance to stretch his legs as the parking lot cleared. 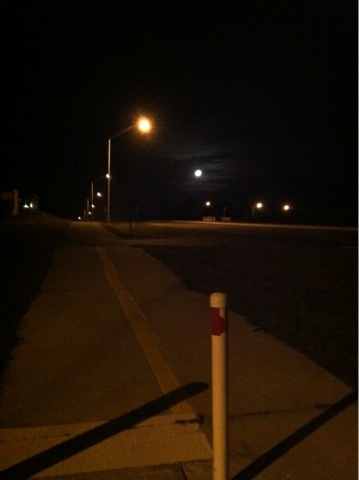 Nice (the dog) only looked up from his pillow and arched his back while I rubbed his shoulder but I was awake and ready to move so I left Nice (the dog) and walked to the next county with the distant glow of Tampa to my right and a bright moon at my shoulder. I walked for miles along a twelve foot wide pedestrian path that ended "nowhere in particular" with a sign stating the obvious,"trail ends". I returned the way I had come watching the moon set completely, glad I had that wake-up call at two a.m.. When I returned hours later and caught a glimpse of my reflection in a mirror I couldn't help but notice the happy guy looking back, "all aglow". Startled myself by looking happy, from walking ...was not expecting that. My daughter and I met you at Micheal's today. She was really impressed and inquisitive the rest of the day about your cause. You are the in our prayers. God Bless!